Rasgulla is a prime favorite Indian dessert recipe & is a favorite sweet of all sweet lovers in the world. 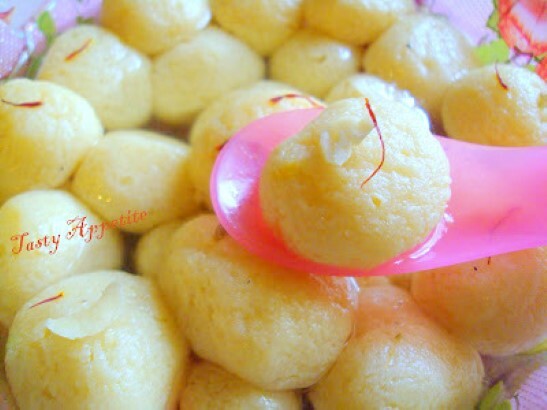 This melt in mouth, soft, spongy rasgullas can be prepared very easily at home. This popular sweet is made with chenna and shaped into balls and soaked in cardamom flavored sugar syrup. Try Rasgulla this Diwali with this easy video recipe and amaze your loved ones! Add whole milk to thick bottomed pan and allow to boil. Once the milk starts boiling, add fresh lemon juice or vinegar. Stir until the milk curdles completely as shown in video. Pour the curdled milk over thin muslin cloth kept in seive and drain the water completely. Now thick paneer is collected in the cloth. No need to throw this whey water. It can be used to knead roti dough, etc. Now wash the paneer along with cloth in running water (refer video) to remove the smell of lemon. Tie the cloth for approximately 30 mins, so the water drains off completely. Now you can see the paneer is ready. Add it to mixing bowl, and knead the paneer gently for 5 to 7 mins until, we get a soft dough. Add sugar to thick bottomed pan. Add water and allow to boil with stirring. Once the sugar dissolves completely, turn the flame to low. Add the soft paneer balls to the hot sugar syrup. Continue boiling the sugar syrup in low flame. Let the paneer gets cooked in sugar syrup. Stir once in a while, to ensure the paneer balls are cooked evenly. Let it cook in low flame for 7 to 10 mins. By this time, you can see the balls are doubled in size. Soft n spongy delicious Rasgullas are ready.